The MunLR1 is a sweeping success! MunLR1, short for Mun Land-and-Return 1 is a space probe sent to the Mun to collect data, to include samples, and return safely to Kerbin. MunLR1 was largely a proof-of-concept for future sample return missions. The mission consists of a probe mounted atop a lander that lands on the Mun, collects samples, and returns. The entire vehicle is designed to maximize return-on-investment by providing the most science value possible. The munar deorbit stage crashes into the Mun, which seismic monitors onboard previous lander missions collect data from. The MunLR1 lander lands on the Mun, collects its own data and then launches. The lander doubles as the first stage of the munar launch. When the first munar launch stage is jettisoned, it crashes into another part of the Mun, which provides even more seismic data for the landers on the Mun to return. The second munar launch stage also doubles as the Trans-Kerbin-Injection stage that sends the probe on a return course with Kerbin. 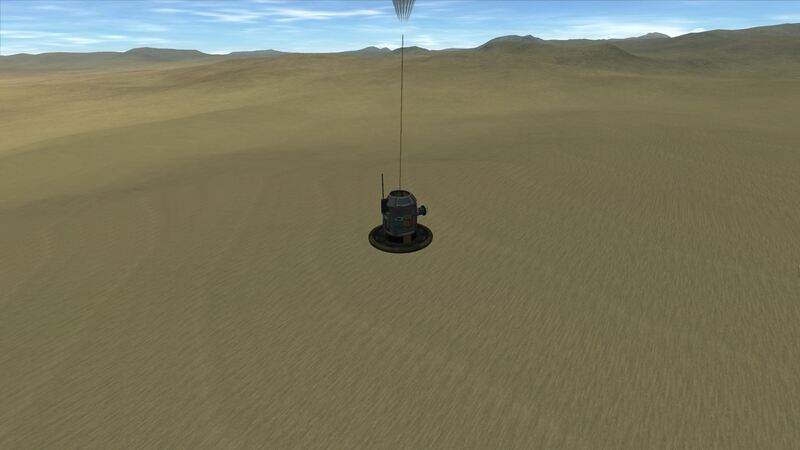 Once the course is achieved, the probe jettisons the return stage and prepares for an 8 hour journey back to the atmosphere and grounds of its homeworld, Kerbin. The MunLR1 was a huge success. Kerbal scientists have learned quite a bit about building sample return missions and the equipment required and will make a few slight improvements that MunLR2 will carry with it. Some of the improvements are better stabilization systems onboard the probe itself and adding another science experiment and more battery capacity.